Two of Famalco group’s mobility industries are having an open weekend at their showroom in Attard next week and it is an opportunity which cannot be ignored. The open weekend, which will start on Friday 23rd November and ends on Sunday 25th November, will see massive discounts at the Fapi Motors and SsangYong Malta showroom in Mdina Road Attard. The showroom will be open from 9.00 am to 9.00pm for the entire weekend, and customers are urged to give it a visit to benefit from deals on all their brands. Fapi Motors, which are the official distributors of Harley-Davidson, Husqvarna, and KTM in Malta, are offering a 30% discount* on all spare parts, accessories, and merchandise as well as a 10% discount* on all bikes in-stock. These discounts apply to all three of Fapi Motor’s brands. SsangYong Malta is also offering an amazing deal, with up to a €1,000 discount* on all vehicles in-stock. Customers will also have the chance to go on test drives for all brands, however, clients are advised that bookings should be done in advance. Furthermore, vouchers from Domino’s Malta will also be distributed, which can be redeemed from one of their stores in Birkirkara or Qawra. Attendees will also be greeted with lively entertainment, making this a fun event which should not be missed. 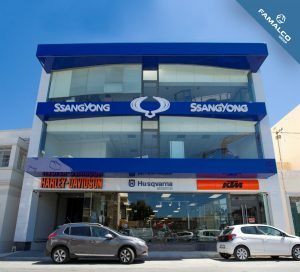 The aim of this open weekend is that both Fapi Motors and SsangYong Malta are able to show appreciation to their esteemed clientele by giving them the chance to benefit from amazing deals on their top of the line brands. Be sure to give them a visit next weekend and you will not be disappointed. For more information about Fapi Motors or SsangYong Malta contact us on (+356) 79001019, on info@FapiMotors.com or info@smotor.mt, or visit our showroom at Focus Building, Mdina Road, Attard ATD 9037. Fapi Motors and SsangYong Malta are Mobility Business Units within Famalco | Building Businesses. *Terms and Conditions apply. All discounts are applied before tax is added.